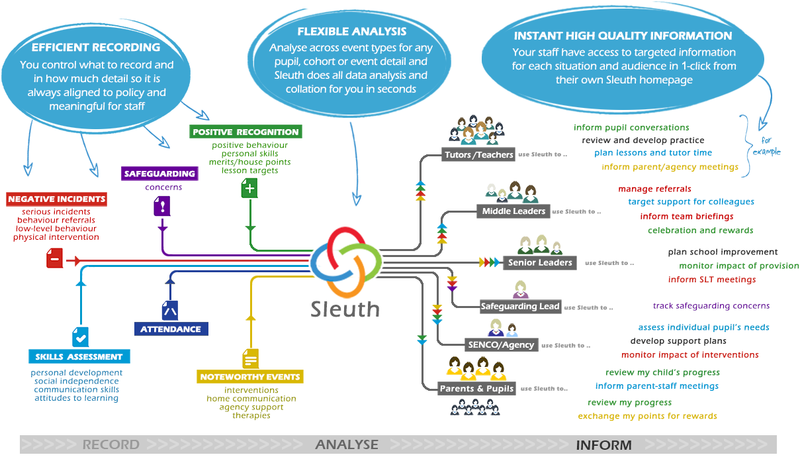 Sleuth is a highly effective software tool for tracking pupil behaviour and personal development. It is used by hundreds of organisations including mainstream primary and secondary schools, special schools, alternative provision and adult learning providers. Tracking is a 3‐stage process involving recording data (about incidents, events and observations) which is then analysed to produce useful information that can inform our decisions and understanding of what’s going on. Note that recording is only the first step; many schools record a significant amount of data but staff often lack the time and tools required to analyse this to turn data into useful information. That’s where Sleuth comes in. Sleuth provides a straightforward means for schools to record, analyse and produce high quality information that is targeted for every situation/audience and is available on demand in 1-click. The graphic below shows the range of different events that it is possible to record in Sleuth. Most importantly, it highlights the potential opportunities for analysing the recorded data to produce a huge range of reports that can be used by different staff roles in different situations. When a staff team have instant access to high quality information it transforms how they communicate and respond to behaviour and pastoral issues, encouraging a collaborative, evidence-based approach where information from Sleuth is routinely used by staff at every opportunity. When this happens, leaders and teachers are better informed and become more effective practitioners, they develop the professional confidence to make a positive difference to pupils’ progress and well-being. We’d love to discuss Sleuth with you and show you how it works and will suppor tyour own pastoral systems and policies. If you would like to arrange an online demonstration please contact us.